Signs: Custom Made - 3D foam, Plastic, Wood & Steel - Dino Rentos Studios, INC.
Are you a business owner in need of a sign for your storefront or location? Or maybe your company logo to display at Tradeshows and Events? Look no further! We have the materials and ability to see your ideas to fruition. Have a logo for your company that you need made into 3D signage? We can take your 2D design and make it 3D. 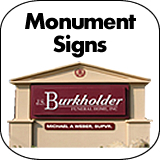 Our signs can be made to withstand the elements and have been secured to storefronts all across the USA. Created with the most up to date materials and coatings, our signs will make an impact! Contact us today and discuss your ideas. This Custom Foam Logo was created for Fairfield Bank to display in their lobby. Custom Foam Signage and Balloons manufactured for The Guadalupe Center Donor Wall.